Yuhuu! Recently we went to Alor Setar for Kedah Fashion Week 2018 and we were so glad to be able to stayed at Keriang Hill Resort. It’s like back to Kampung Life, we love to be surrounded by lush greenery with Gunung Keriang as the backdrop, the serenity and of course the kampung house. Let’s check it out. Basically, Keriang Hill Resort is located at the foot of Keriang Hill or Gunung Keriang. It’s about 10km or 20minutes drive from Alor Setar. The resort is surrounded by greenery, paddy field, and rivers. Plus The Paddy Museum or Muzium Padi of Kedah is just next to the resort. Kedah is consider the “Rice Bowl” or “Jelapang Padi” of Malaysia, therefore along the road we see paddy fields on left and right too. For first timer, it is a must to get down and take photo at the paddy field. The resort has 15 hut or pondok that were built with concept like kampung house, each house has a different design. Do you know that the kampung houses are transported to Keriang Hill from different towns of Kedah. It’s like village resort within the vicinity of city. Tadah!!! Welcome to my kampung hut, Bukit Meriam. I think this hut is transport , I guess my kampung hut is from Bukit Meriam. Mine is the standard hut and there is Family Hut which is bigger and has two queen size bed, perfect for 4 pax. Breakfast will be sent to my hut every day at about 8am. I usually ate my breakfast at the balcony while enjoying the nature sight and sound. My hut is equipped with air-conditioner, water heater, living room, working area, toilet and bathroom, television, dvd player, iron, mini bar, coffee tea making facilities, and king size bed. The hut design is traditional but equipped with modern facilities. However, there is no wifi in the room, you can have a stronger signal at the restaurant or reception area. Other facilities at the resort include gymnasium, swimming pool, and also event areas such as meeting room, main stage, hall, restaurant and more. On the second day of my stay, I managed to explore the whole resort and spotted many Instagram-worthy spots too. 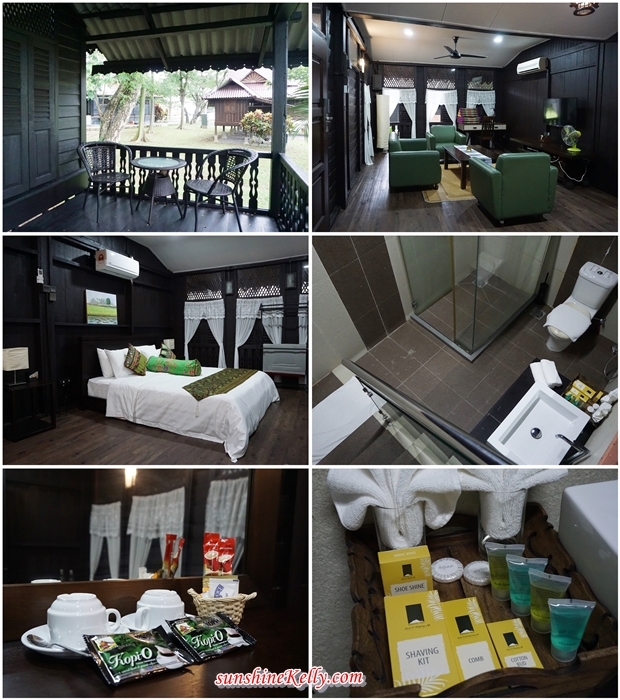 Overall I had a relaxing and memorable stay at Keriang Hill Resort. It’s like back to kampung life, if you wish to have a feel what’s is it like to stay in kampung hut then do make a visit to Keriag Hill. Address: Keriang Hill Resort Mukim Gunung 06570 Alor Setar, Kedah Darul Aman. You look gorgeous laa wearing baju kurung! searching for a place to stay, kelly.